Good, then those people (in addition to the majority of M34/34A riders) will have better service, because that's exactly what I'm proposing: More service to both of those destinations. How is it better service if they don't have buses running where they once did? I think they should combine both branches into one route that travels from 34th & 12th to Waterside Plaza. Eastbound/southbound buses would run down the FDR Drive between 34th Street & 23rd Street (so that a connection to the northbound M15 and NYU Medical Center at 34th & 1st is maintained). Peter Cooper Village is still served by the M23 for crosstown service. For the PABT, the southern entrance at 40th Street is 6 blocks from 34th Street, and for those that don't want to walk it (or can't walk it), there's the subway and the M11/M20 available (depending on the direction). By comparison, there's no alternative to the western portion of the M34, so those riders are stuck waiting for a 12th Avenue-bound bus in particular. At the very least, I would get rid of the eastern branch (which it looks like the MTA is already leaning towards, since they rerouted those trips to Waterside). There's a bus that circulates around East Midtown that is designed for ferry riders anyway. Right, so the buses that currently run to the PABT would be redirected to 34th & 12th (which is in West Midtown), and the (remaining) buses that run to Marginal Street would be redirected to Waterside Plaza (but in a manner that still serves riders at 34th & 1st eastbound, which is one short block from Marginal Street). So Waterside Plaza and West Midtown would be the primary beneficiaries of this plan (which I so selfishly created) , but riders along the core portion benefit from less bunching, because at least the buses have two consistent terminals (and also, 9th Avenue doesn't have a bus lane, whereas the western part of 34th Street does). There's nothing funny about it because I rarely if ever use the M34, so it wouldn't benefit me. Adding service seems like a no-brainer, given how infrequent each branch is. While we're talking about adding service, you need to learn how to read. All I said was add service. I didn't say how much so I'm not sure where you got this "doubling service blindly" from. Your plans usually involve screwing someone over, supposedly to "benefit" everyone. I don't necessarily have a problem with running all M34's to Waterside (and few people remain on along the 2 Avenue stops anyways so I guess it can be justified), but I cannot agree with sending every bus to Javits. The West Side does not need so much bus service, the M34 suffices. Additionally, I have seen people use the buses (during off peak hours) north of 34 Street. IDK how packed buses are during the rush, but it makes sense to run them to PABT. Without it, many who work along 34th would have to walk up to 42 Street or rely on the M11/M20 , neither of which is pleasant to have to connect/transfer to (each for their own reasons). People probably have long commutes before getting to the PABT anyway, and that would create a disservice for those going beyond PABT. I would look into attempting to bring back the M27 (perhaps during the rush hours), and sending the M50 somewhere else on the east side. Someone who understands the commutes of others instead of thinking of themselves constantly. Where exactly would you send the M50 though? Let's remember why it was cut back from the UN in the first place. Last I checked, shorter wait times are a benefit, not a "benefit". And the only way for your proposal to benefit West Midtown and Waterside Plaza riders (which we've already established I'm not one of them, so therefore, this proposal has nothing to do with my self-interest) more than mine is for you to double (or more than double) the existing frequencies....mathematically, that's the only possible way. But you don't understand numbers (and are proud of it), so it's like talking to a wall. But true, I will say that at least that branch connects to a major hub and gets its share of riders. And I would also tend to agree with bringing back the M27. With how slow they are, a lot of the ridership on crosstown routes depends on the frequency, so by bumping up the frequency on the core part of 49th/50th Street, that should bring back ridership to that corridor. But I'd leave it ending at 1st Avenue with the M50. The M50 had low ridership to the UN, and heading north towards the Queensborough Bridge would only serve to add another source of congestion and delays. So you're telling me you don't use the M34.... BS... The 34th Street corridor does not have to necessarily have service upped on both branches to improve. Alright, and I'm also hell-bent on providing benefits to riders on a route that doesn't go where I go (and would remain doing so). Right yet you claim you take the express bus into Manhattan, so you're never in Manhattan and then you talk about your subway trips. You're full of $hit. One minute you travel all over and the next minute you only travel within Staten Island. You can't make this stuff up! Logically, I have to take the express bus to either Lower or Midtown Manhattan and transfer to the subway there to reach Upper Manhattan. Or am I not allowed to work and live in one borough and attend school in another? (**shrugs**) Too late, I guess, already done. Also, going back to the M101 split discussion we had before, one alternative to branching the M98 to Inwood and Washington Heights (whether it's 168th Street/NY Presbyterian or the current terminal) would be to have it run up Broadway and terminate in Inwood (that way, it serves both Washington Heights & Inwood without branching). Just cut the crap and stop with the lies and you'll be fine. The way you "claim" to travel so much, I find it hard to believe that you don't use the M34, yet you have intimate knowledge of where it gets its riders from. I believe the quotation marks should be around "travel" and not "claim". Just the other day I was heading to the BxM1... Anywho, the M34 should remain as is with an extra bus here and there. One of the issues that has annoyed me with the M34/34A +SBS+ is that on the branches, service is infrequent. The MTA already rerouted some M34 buses (from 12th Avenue) to run to/from Waterside Plaza (including the last few buses of the night), showing you that they consider that branch an afterthought. So where would you terminate the additional buses if not the PABT? 10th Avenue (and turn around via 9th-33rd-10th-34th). That's still an exit to the Lincoln Tunnel but it's less crowded for whatever reason. And funny enough, I remember one time I was waiting for the X17J at the PABT and I asked a guy if it passed already, and he said "I don't know, I'm waiting for the 42". I thought there was some kind of detour where the X42 was rerouted, and then I realized he was actually referring to the M42. Yeah, that was my assumption (that Inwood-East Harlem would be the larger/dominant ridership base, over Inwood-East Midtown). BTW, back when the M98 actually ran to East Midtown, how was ridership along Fort Washington Avenue? Wow, with all the routes that run over the GWB (both the jitneys and NJT routes), it's kind of funny somebody would propose the Bx13 to run there. but yeah, a Bronx route would probably also work. The reason I chose the M5 is more because it could use the small ridership boost more than the Bronx routes (since the M4 is used a little bit more in that section of Upper Manhattan), but it's nothing I feel too strongly about, as long as something is serving that area. Foolish.... Both routes cover extremely hilly areas with no subway service, and the Bx3 is a workhorse. You would just make the line more unreliable for no reason. My question is how in the hell would a combination even be done? That is off-topic. Isn't there a Bronx Proposals thread? The routes in question go into Manhattan so it's somewhat relevant. ...And I would also tend to agree with bringing back the M27. With how slow they are, a lot of the ridership on crosstown routes depends on the frequency, so by bumping up the frequency on the core part of 49th/50th Street, that should bring back ridership to that corridor. But I'd leave it ending at 1st Avenue with the M50. The M50 had low ridership to the UN, and heading north towards the Queensborough Bridge would only serve to add another source of congestion and delays. My question is how is the Manhattan portion maintained? Don't both buses go into Manhattan? There wouldn't be any Manhattan portion. Not wild about buses using Dyer to be honest. Experiencing what it's like on the X17J, I'd try to have routes avoid that street where possible. So what would cover the northern part of Sedgwick then? The Bx32? 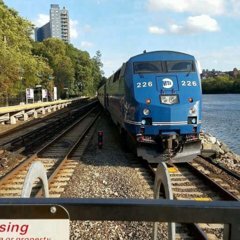 (Shoot, at that point, you might as well just have the Bx3 terminate at the VA Hospital for an easy turnaround) I mean, it might be a good shortcut to get over to the train, compared to the Bx1/2/10 that loop around the reservoir.